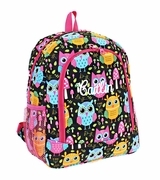 Personalized kids backpacks. Fun, whimsical, and colorful backpack for back to school. Choose the adorable itsy bitsy spider. Durable lightweight washable canvas with front zip pocket and padded shoulder straps. Kids backpacks measure 14"H x 12"W x 4" across the bottom. Vinyl-lined interior.